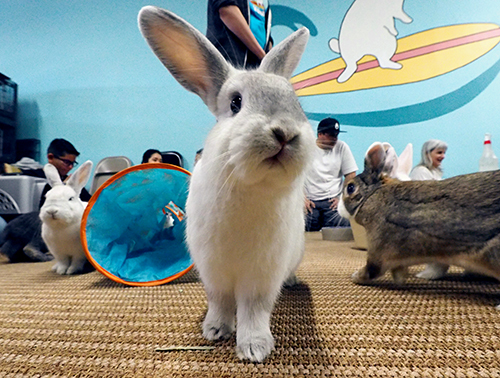 Join us at our new Rabbit Adoption Center and Bunny Store to help us care for San Diego's rescued rabbits and our community of rabbit-lovers. We have many opportunities for volunteering and can help match you to a position that meets your interests and skills. Our new Rabbit Center opened in late June 2014 and we need many helpers to care for the bunnies and maintain the center. Join us - we look forward to having you on our team! Store Clerk – Assists Store Manager with stocking, pricing, displaying merchandise and keeping store neat and clean. The Store Clerk also assists the public with carrying merchandise to their cars. Groomer – Grooming customer’s rabbits which includes combing/brushing, cutting nails and gently cleaning scent glands. Training required. Store Educator – Answer customer questions regarding rabbit care and supplies. A Store Educator must have attended at least one Community Outreach Volunteer seminar prior to helping in the Store and must have read the HRS Guidebook for Educators.Educator must provide information according to HRS philosophies and guidelines. Mailings - assist with stuffing envelopes, etc. Packing hay is a great first step in volunteering because you meet lots of fellow bunny “slaves.” Bales of hay are broken apart and packed into boxes for sale. We have 2 groups of “hay elves” that pack hay for SDHRS. The North County group packs at SD Storage on Mission Blvd. in San Marcos (near Nordahl Road) on the second and fourth Saturdays of every month from 8:30 a.m. to approximately 10:00 a.m. Hay is then delivered via SUV and pick up truck to the Bunny Store in Kearny Mesa and to VCA Acacia Animal Hospital in Escondido. The second group is the Kearny Mesa group that packs in the parking lot of the Bunny Store on the first and third Saturdays of every month from approximately 8:30 a.m to 10:30 a.m. (If you are running late, no problem! Come when you can.) 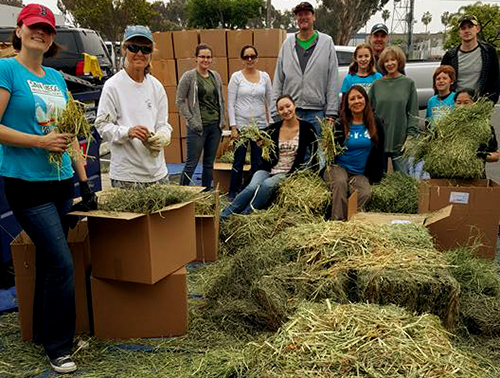 Hay is then delivered into the Store and to Rancho San Diego Animal Hospital in El Cajon. 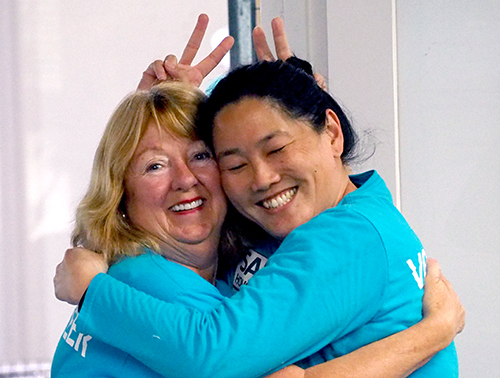 Help with Bunny 101 classes, volunteer orientations, summer camps, school or scouts visitors, and community outreach events (typically Saturday or Sunday). Coordinate special events including Open Houses, Hoppy Hours, Bunny Agility, Bunnyfest and social events of any kind. Rabbit Care: Feed rabbits, clean litter boxes & pens, exercise & socialize rabbits and Intake/Medical assistance. Adoption Assistants: Help with adoptions as they occur. General Support: Pick up donated veggies, turn in recyclables, run errands, pick up supplies, vet appointment transporting, rabbit transporters. This position requires a valid drivers license and the use of your car. Distribute posters & flyers to alert the public about adoption days and special events. Distribute them throughout your neighborhood at such places as Starbucks, Panera Cafes, Grocery Store windows/bulletin boards, School or Church Bulletin Boards, and anywhere posting of flyers is allowed. We will provide you with the flyers to copy but if you cannot copy them yourself, we will make arrangements for you to pick up copies at the SDHRS Bunny Store. Are you a former human resources professional or have you coordinated volunteers in a past position? We need you! Must work well with people and be able to communicate well with different personalities and be mindful of people’s expectations and feelings. The Volunteer Coordinator will report to the Co-Chapter Managers and work with them to recruit and fill volunteer positions. This includes creating flyers and distributing to various areas, creating ads or postings for Facebook, Craig’s List, newspapers, and other outlets for getting out the word of our need for volunteers. This person would also contact groups such as sororities, fraternities, scouting troops, etc. that wish to give community service hours to nonprofit organizations. The coordinator will organize Orientation sessions for new volunteers; ensuring that they complete all necessary paperwork, including applications, standards of conduct agreements, work area preferences, and more. This person will also refer each volunteer recruit to their appropriate team leader in the area in which they wish to work. The coordinator will make sure each volunteer purchases their volunteer shirt after they complete their training and receive an assignment. The Volunteer Coordinator will assist team leaders in putting together volunteer schedules and recruiting to fill the schedules. Fostering a rescued rabbit is a great way to save a life. If you are not able to make a lifetime commitment to a rabbit at this time, then fostering may be a good fit for you. San Diego HRS has an Adoption Center where the majority of its foster rabbits reside. Foster homes are needed for those rabbits not yet ready for the adoption center floor or when space is not currently available. Newly received rabbits may need some medical treatment before becoming available or more socialization. Foster homes are also needed to care for mothers and newborns until they are old enough to become adopted. Additionally, we sometimes have rabbits who need a break from the adoption center. These rabbits can become depressed, frustrated, or angry and aggressive when they have to wait so long for a home. Getting these bunnies into a foster home for a period of time can give them the one-on-one time and attention they deserve and help to turn their outlook into a positive one. Foster parents work directly with the Adoptions Director regarding all aspects of their foster rabbit's care. We will occasionally allow a foster home to adopt their own foster rabbit but this is discouraged after one or two instances, as it creates an overload on the foster home and reduces our ability to take in rabbits needing to be saved. 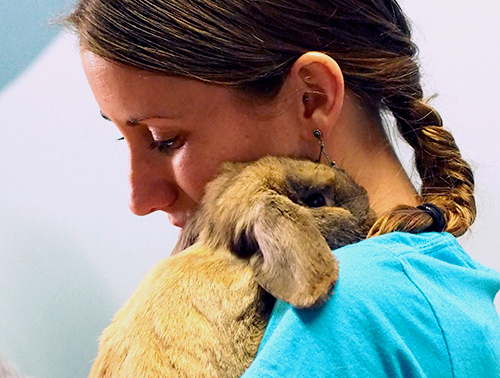 Volunteers with rabbit experience are preferred, but we can train novices. The important thing is that our foster homes follow the SDHRS Guidelines for rabbit care (please read our Rabbit Care section on this website). We do expect our foster homes to follow our direction in the care of the rabbit(s), especially with regard to housing, food, and exercise time. Foster homes must agree to bring their rabbit to the Adoption Center for adoption appointments or once the Adoptions Director decides the rabbit can be moved permanently to the Center. Foster home applicants who are new to rabbits must attend our Bunny 101 class. 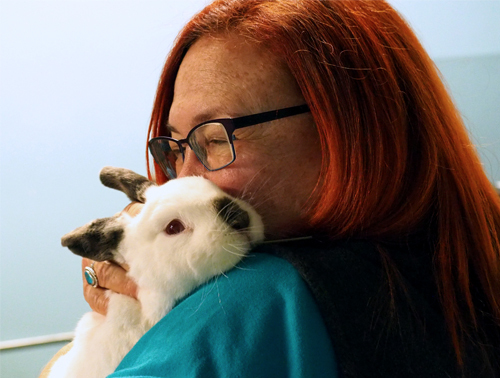 If a foster home's rabbit experience has been in a very different environment than how SDHRS cares for its rabbits, they will also be asked to attend the Bunny 101. This class is free to volunteers. Classes are held Saturday mornings at 10:30 a.m.
We also have a need for Sanctuary homes. 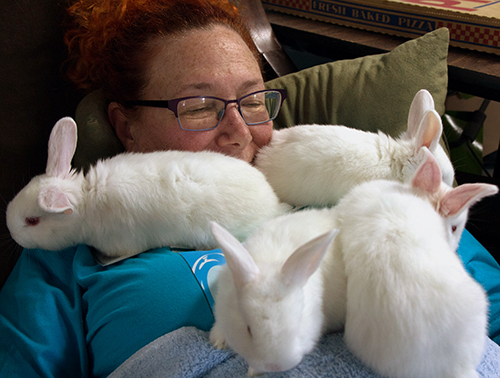 These are foster homes that keep the rabbit for its lifetime. Most rabbits are put into Sanctuary status because of a chronic behavior or medical issue that makes them not so adoptable. 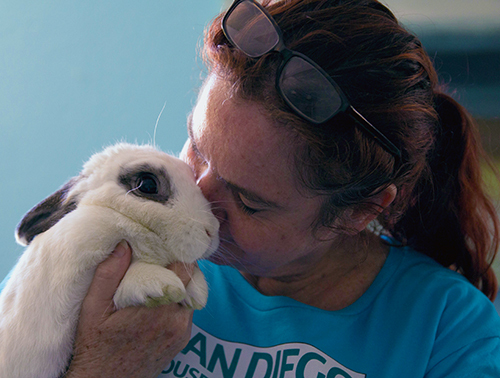 The rabbit remains the property of SDHRS but lives with the volunteer for the remainder of its lifetime. Many sanctuary homes fall in love with their sanctuary fosters and end up adopting them, but this is not at all expected. We also need sanctuary homes that can care for special needs (disabled) rabbits. Foster homes are people generally experienced in caring for rabbits, who have room in their homes to house, exercise, socialize, and care for a foster rabbit(s) until the rabbit is moved to the Adoption Center. This is done in accordance with HRS guidelines for care, diet and handling (sanctuary homes keep the rabbit for its lifetime). Requested minimum commitment is 2 months, but can last longer if their foster rabbit does not get adopted within that time period. It can also be less, when the rabbit is moved to the Adoption Center and the foster family wants to take a break or stop fostering. Foster rabbits are required to be housed in a separate pen or cage from a fosterer's own rabbits. Each foster rabbit must get adequate run every day (two hours or so), in a safe, bunny proofed environment. Foster rabbits are to live indoors only, preferably in an area of the home where they will get a lot of attention. This serves to socialize them in preparation for a new home. All foster homes are evaluated in advance, for their suitability for caring for foster rabbits, based on the environment. For example of you had a dog with a high prey drive (a terrier, bird dog, Akita, etc.) it would not be safe for a rabbit. Or, if you have young children, you might not have enough time to give (rabbits are like 2 year olds themselves). Homes are evaluated for suitability on a case-by-case basis, by working with the interested volunteer to get an idea of their experience and room for housing. We also review the environment (safe from overactive dogs, predators, etc.) and the foster parent's ability to handle the work load. For example, if someone is disabled and cannot lift the litter box, or pen, it might not be a good match for their abilities. Foster homes must be able to transport their rabbits to and from the vet (using HRS' contracted vets for care) and to adoption days as requested. Having transportation is important. SDHRS will provide a housing setup for the rabbit, along with basic supplies (litter box, food & water bowls, etc.) and boxed hay. Foster homes are responsible for providing fresh greens daily and pellets (usually Oxbow Bunny Basics T, unless rabbit is young then an approved alfalfa pellet). SDHRS can also provide some toys and other extras for foster bunnies. HRS provides all vet care through its contracted vets. The SDHRS Adoption Director manages all vet care and reviews all cases, making decisions on the level of vet care provided, in discussion with the foster home. All vet visits must be approved in advance by the Adoptions Director, unless the situation is a "life or death" emergency. In that case the rabbit should be immediately transported to an HRS-approved vet clinic and the Adoptions Director contacted as soon as possible. Foster homes are required to bring their foster rabbits to adoption days, as needed, so they can have a chance at being adopted. The Adoptions Director does all adoption screenings and determines which rabbits are needed for adoption day, sending out email announcements in advance. Foster homes must monitor their email for messages about upcoming adoption days. Foster homes must provide feedback to the Adoptions Director on the personality, litter box traits, and behaviors of their foster rabbit. This helps determine what types of homes are suitable for the rabbit. We need to know if the foster rabbit is good with children, other animals, or has any behavior issues or medical concerns. Foster rabbits must have current photographs on file for use on adoption websites. 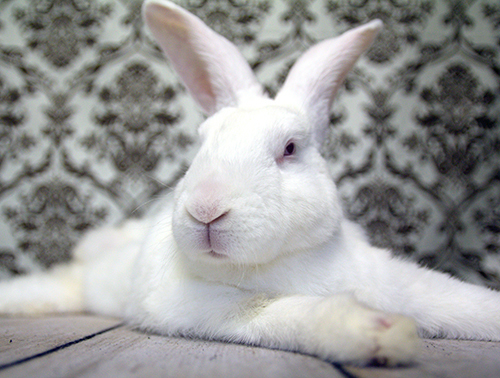 Foster homes must either provide these photos or bring their rabbits to scheduled photos sessions at the Adoption Center (not necessary for sanctuary rabbits). Rabbits are placed with foster homes usually based on the home's capabilities or willingness to take certains types of rabbits. Some foster homes are good with medical care, some need easier bunnies, and some are great with behavioral issues. The Adoptions Director is responsible for taking rabbits from shelters or other situations, and assigning them to foster homes. Foster homes begin with only one or two rabbits. Later, if they have become comfortable with the process and have room to take more, additional rabbits may be assigned to them by the Adoptions Director. *** Any rabbit taken in by a foster home "without prior written permission of the Adoptions Director" becomes the personal property of that individual. SDHRS will not accept responsibility for that rabbit and will not cover any costs or medical treatment for the rabbit. For more information about fostering for San Diego House Rabbit Society, please email foster@sandiegorabbits.org.